Members of Ógra Shinn Féin, along with local Cobh Sinn Féin representatives Cllr Kieran McCarthy and Jim Curry, will be continuing their protests at the failure of the authorities to clarify the situation regarding the former Irish Steel/Ispat site on Haulbowline, at 6pm on Friday the 22nd. 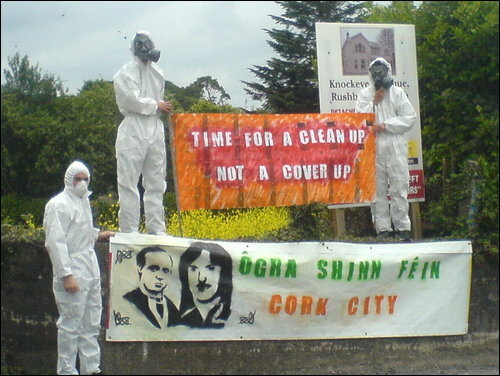 A number of Ógra activists in the newly formed McCurtain/Doherty Ógra Cumann in Cork City were recently in Cobh to protest at the lack of clarity and information coming from the government, and will continue their campaign this Friday. The site of the former Irish Steel/Ispat plant was recently found to have dangerous levels of lethal toxins such as Chromium 6 and mercury. Recent statistics from the National Cancer Registry showed that cancer levels in the town of Cobh are 44% above the national average. Higher cancer rates are also found in Carrigaline, Ringaskiddy and Passage/Monkstown.